People are not born being judgemental. This way of thinking is learned, taken in as we grow up. If we see our parents, aunts, uncles, and other adults around us judging other people, then isn’t it understandable that when we grow up, we might have the tendency to be judgemental? We might not even realize that we tend to judge other people! But then, when we are at the receiving end, things suddenly become unfair, doesn’t it? 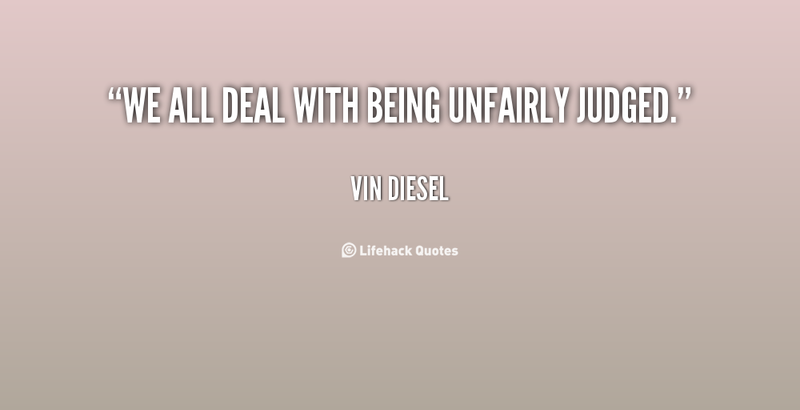 We think that being judged (unfairly, most of the time) is “just not right”, and we react negatively to it. There are always two sides to a coin, and if you are going through a situation where judging or being judged is an issue, here are some quotes that may help you gain a better perspective. Judging… our perception of how we see others in any situations or even ourselves, how others make us feel whether it is good or bad, “personal opinion” The most important thing to keep in mind is our “reaction” (more on the bad side) that is a fine line. I find taking the “high road” is always the best and very difficult to control at times when one keeps most things in to ones self. I read alot of books and artiles, blogs and such. I found this Coffee Cafe like two weeks ago and love it! Many interesting things grasp my attention (and there is alot) A couple of years ago i read “The Four Agreements” by Migual Ruiz, I made a copy of those aggreements as a reminder to be “Impeccable with my word, Never to take anything personally, Don’t make assumptions and always do my best, “judging myself” how well I do with those in any situation. (I recommend reading this book) and others I have read, I am always on the hunt for more! In my opinion this Judging article is an excellent read and scratched me where I itched! By the way this is my “first” comment I have ever wrote. Thank you! “Grab a cup, a great read, and Have a great day!! !